A planted aquarium can be surprisingly beautiful, enhancing any interior space through the vibrant and lively colors it offers. 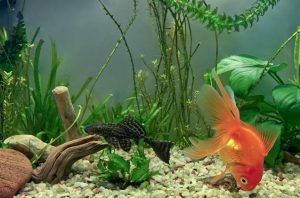 Besides the aesthetically pleasing presence, freshwater aquarium plants also ensure a natural filtration for the water and help keep fish healthier. 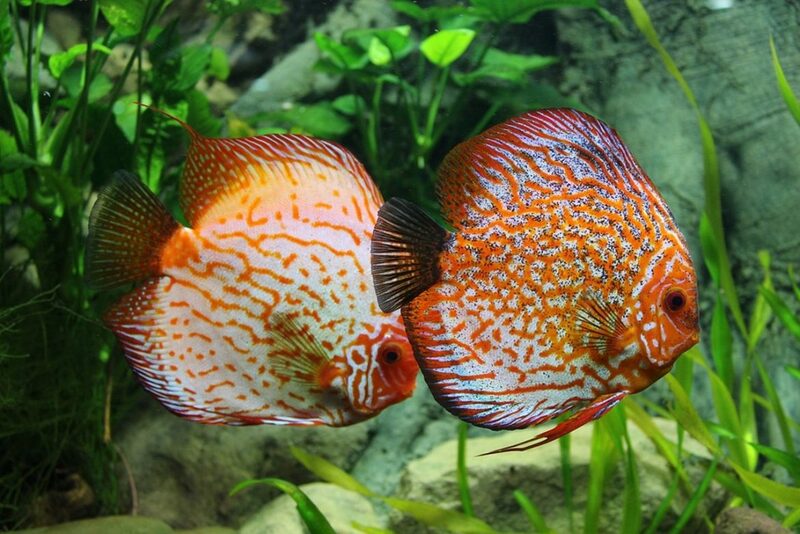 They can provide good spaces for mating, this way helping you grow the number of fish, as well as safety, comfort, and food. All of these benefits make them a vital element for maintaining a healthy aquarium system. If you are just getting started with this hobby, then you might want to choose plants that are easy to maintain. Since things might not be very clear at first, we’ve decided to give you a hand by putting together the list below which contains some of the freshwater aquarium plants that fit the bill. Although setting up the entire aquarium on the same day might seem like a very good idea, there a very high chance that it’s actually not. Every tank needs to go through a process called cycling. During this time, the water quality and parameters can significantly vary and that is why experienced hobbyists will tell you to avoid adding fish in it. If you do add them, there a high chance that they will not survive this process. The good news is that plants don’t have the same needs as live fish and can make it through this process quite easily. For this reason, you’re free to add plants right away, the only trick being to have the right tools for getting the job done in order to avoid any harm as you plant them. There are three main categories of plants used for most aquariums, namely foreground, midground, and background. Each type has different needs when it comes to lighting and setups that can make them grow much faster. You can also think about adding a fish tank background for an enhanced effect. There are certain carpeting plants such as Java Moss, Willow Moss, or Water Wisteria that tend to stay low to the ground. They spread horizontally across the aquarium’s floor and, for this reason, they make great foreground plants. Plus, they also work to improve the water’s quality, since they grow quickly and are able to filter larger quantities in a relatively short amount of time. The Java Moss is one of the most common plants that you can find in a tank. Since it’s easy to maintain and it grows quickly, it’s a very good choice for someone who is setting up a tank for the first time. If it’s attached to a rock, it will grow and crawl over the tank’s surface. Since it’s well-known that it tends to float, you might want to attach it to a stable element. In terms of conditions that need to be ensured, the Java Moss can tolerate water between 72-90 degrees Fahrenheit, the optimal temperature that enables it to grow in the fastest way being 73 degrees. The lighting preferences are not particularly special since this plant grows well in almost any conditions, but if you want to ensure its fastest development, then medium-high lighting conditions should be provided. In terms of benefits, this plant ensures a cover and stabilization for the substrate, as well as protection and mating spaces for certain fish species. This is another example of a carpeting plant for freshwater tanks. Thanks to its structure, it offers endless escaping possibilities, which makes it very useful for those times when fish feel the need to hide. Plus, it looks great next to decorating stones and it contrasts beautifully with dark soil or sand. What makes the Marsilea Minuta an excellent choice is the fact that it’s very easy to grow, so you’ll spend time trimming it quite often. On the other hand, this is definitely a good thing. It tolerates almost any environment, and the ideal temperature to ensure the highest growth rate is between 73 and 78 degrees Fahrenheit. In terms of other conditions, a medium lighting is ideal, although it can develop in other setups as well. Used for decoration, this plant also ensures carpeting and protection, so it’s definitely a good addition to most freshwater aquariums. The Amazon Sword is a midground plant, being the staple of most aquascapes. Of course, this one as well is easy to maintain and it grows fast which makes it a very good choice when you want to arrange a corner of the tank since it looks very beautiful when placed in an appropriate space. The thing to keep in mind here is that these plants can grow quite a lot, going up to 20 inches, and for this reason, they are mostly planted in the mid-background area. When it comes to the water preferences, this plant as well is comfortable between 72 and 82 degrees Fahrenheit, while its growth is optimal in medium lighting conditions. Given its growing capabilities, this plant as well is used for decoration, as well as for hiding any hardware or plumbing. It’s, of course, also used for protection. Another example of a midground plant, the Java Fern is a very low-maintenance plant that has a unique look which makes it one of the preferred types by experienced aquascapers. One of the main benefits it offers is that it can be planted in almost any spot around the aquarium without distracting from the hardscape. Of course, its vibrant colors also make it look very good, and that’s why it’s mainly used for decoration and protection. The conditions it needs for a fast and healthy development is a water temperature between 72 and 78 degrees Fahrenheit and a low to medium lighting. 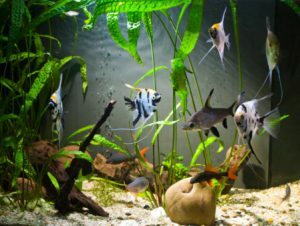 There are many other types of plants out there that can be successfully used to decorate and protect your aquarium, but you can safely start with these and then keep on adding more according to the available space and the needs of the system you create.